Let’s talk about something that’s a little different today. Boots. As locksmiths, we put in a lot of hours and so we’re constantly on our feet. We’re on our feet in all sorts of weather. 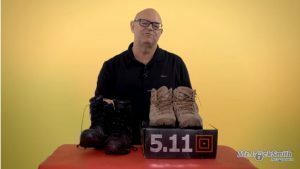 Today we’re going talk about my 5.11 boots that I wear all the time. 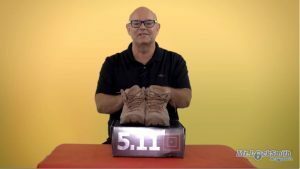 The 5.11 Tactile six inch Coyote boot. They’re water resistant. I promise, these boots are water proof because I’ve been in water in them and I still got my feet dry. These boots are over five years old. And I use them daily. I have two pairs of these boots, as I alternate them. I had to put in some inserts. They just seems to make your feet feel better. And they are super-comfortable. I was heading to the Philippines and that place is hot and humid. It’s absolutely terrible on the feet. I’m not a flip flop person, because I like my feet protected so I can’t walk around with flip flops. These 5.11 Tactile six inch Coyote boots are meant for hot, humid, even desert environments. I wore these for almost ten weeks straight. Every single day, in the jungle, on the water, heading to little islands (if you saw, I was in McArthur Park where general McArthur landed). I went up the hill (a bunch of hills where they had to attack bunkers, Japanese-held bunkers). This 5.11 Tactile six inch Coyote boot what I had on my feet. Although I didn’t see any snakes, there’s lots of snakes there that are bad. But it was so hot, and these were absolutely fantastic. I wore them and so I thought next time I go down to Florida, Texas, I’m gonna be wearing these. These are my go-to boots now in the summer time. They’ve got this antibacterial stuff, and all sorts of bits and pieces. You can read about it online. These were super comfortable. I definitely recommend this. I’m heading back to Asia and I’m wearing these. I bought a second pair. I always like to alternate my shoes, so I’ll have these again, because they’re FANTASTIC. However, I think the only downside, when I jumped off of a boat into the salt water, I got both wet, and it didn’t take that. It took probably about four hours in the sun to dry ’em out. And it kinda pissed me off a little bit. It means that it’s not meant to go in the water. You’re gonna get wet feet if you do that. Nevertheless, for 99% of what I did, these were absolutely fantastic. The water resistance might not be that good but, they’re so comfortable I don’t wanna add anything to them. 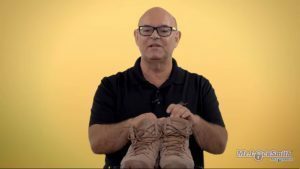 So, if anybody has any good ideas on a boot that’s good for super hot, humid, almost desert-y jungle conditions, that has some water resistance, I’d be really interested in knowing because that’s the only downside of these boots. Other than that, 99.9% absolutely fantastic. Super super comfortable. I liked it so much that I bought a second pair. And again, this is different and nothing to do with locksmithing, but we gotta have comfortable feet. I hope you enjoyed watching this video. Subscribe to my channel. 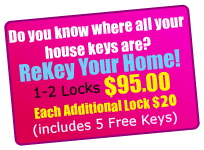 Also visit my website and you can see what online locksmith training I have for beginners, intermediate, and advanced. As well as my covert methods of entry and my non-destructive methods of entry.